Ithaca, NY. One grey October Sunday morning in 1999, I was shockingly out of supplies for breakfast. After an hour or so of mental dry-spinning – a consequence of my yawny hungry-ness – I fetched my coat and went down the hill to see where I’d find some food. First I meandered through the whole downtown without much success. When I finally entered the DeWitt mall, the cafe was just about to open, and completely empty. So I spent three days in Germany. Transportation logistics excluded proper restaurant visits, so I made the stay a wursty experience, in spite of my freshly triggered reservations about meat freshness. Sausage consumption began on Friday afternoon at the Göteborg bus terminal, where the Frankfurter & Cabanossy grill sells what I believe to be the best sausage to be bought anywhere in Sweden (as a touring musician, I’ve tested them all). I remember that their many kinds of sausages are made by an Austrian specialist – I don’t know whether this is still true, but the products are in any case better than what you get in the kiosk at the other end of the station. They also provide unsweetened German mustard, if you ask for it. Our first two batches of sausage in the freezer are diminishing at an alarming rate. This is mainly due to the fact that the sage-flavored breakfast sausage goes so well together with the maple syrup that we brought back from Virginia in October, that the chestnut-white-wine sausage was a smaller batch and that the chorizo-flavored variety was a welcome addition to a larger quantity of Sauerkraut the other day. So I made sausages again. An appropriate opening for this blog. Yesterday I bought a pile of pork sides and a few metres of casings. I ground half of the meat finely and the other half coarsely and spiced them up in various ways. 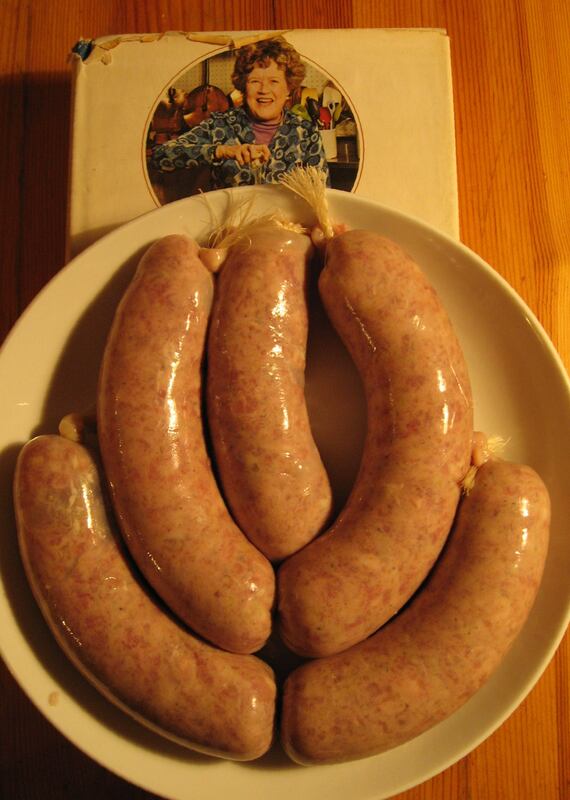 Today, I created 2 kg sausages, most of which were directly confined to the freezer for later feasts. This is no mere doodling or petty re-enacting of the ways of the olden days. Just take a look at the package of the sausages in the shop. It is possibly for reasons of tradition that the various kinds of Swedish sausages contain potato flakes (what are “potatisflingor” in English??) and sometimes sugar. Up to this point, my astonishment is just a marker of cultural differences and not really a quality judgment, although I don’t feel that a product with a meat content of some 70% ought to be called a “sausage”. In Sweden this would be korv in any case, so I should be content. I am much more concerned about those ingredients that all the sausages of the world contain. Nitrites etc. : Julia Child (In From Julia Child’s Kitchen, p. 363-4) gives a nice short overview about how harmful a bite of sausage preserved in the traditional way (with nitrates) is likely to be. Not all that harmful, according to her. So perhaps adding nitrites would not be a major concern (or would it? ), but since I now can freeze my sausages, I believe I’m more comfortable with just: salt.